This stylish apartment, only 7km from the CBD, is ideal for investors, first home buyers and those looking to enjoy a vibrant, urban lifestyle. 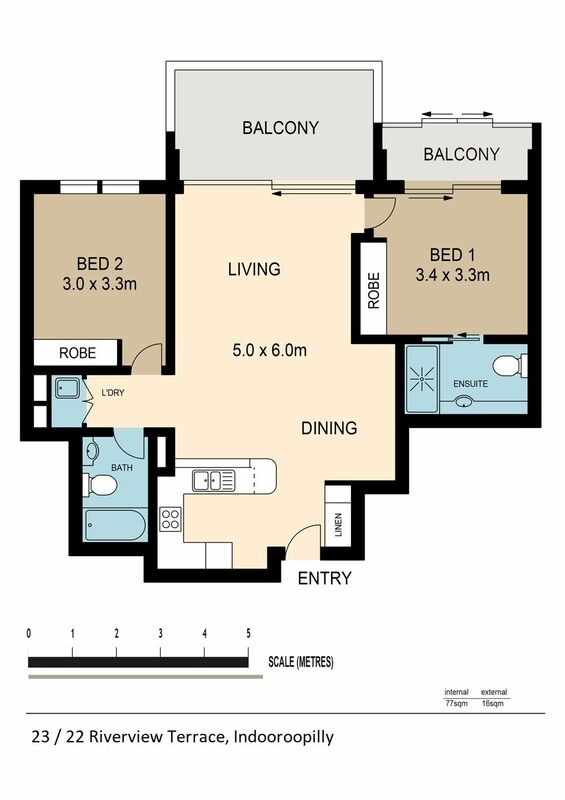 The 2-bedroom, 2-bathroom property is on the 3rd floor of the secure ‘Riva’ Apartments. Riva is one of the most recognised buildings in the area and has fantastic views in all directions. The complex has wonderful facilities, including on-site management, pool, spa, wet bar and entertaining area. Unit 23 has a gleaming, contemporary kitchen, with stone benchtops, a gas cooktop, stainless oven, dishwasher and breakfast bar. It adjoins the air-conditioned dining and lounge area, which opens via sliding doors to a private and sheltered deck with river views which further enhances the entertainment space. There are two bedrooms; the Master has a large built-in wardrobe, its own private balcony and an ensuite with shower. The other bedroom also has built-in storage, while the modern main bathroom has a shower over bath. The apartment also features an internal laundry. The apartment has one car space with a storage cage situated behind it and there is plenty of visitor parking in the complex. The location is outstanding and so central. It’s an easy walk to Indooroopilly Shopping Centre, cafes, great transport options and bikeways; and it’s a short commute to golf courses, quality schools and universities. This is a great opportunity to secure a central apartment for yourself, your children or as an investment.